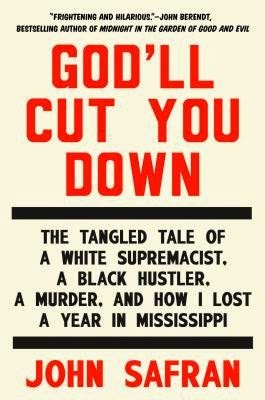 John Safran--a young, white, Jewish Australian who makes comedy films--seems an unlikely candidate to write a true-crime book, but that's what he's done with God'll Cut You Down: The Tangled Tale of a White Supremacist, a Black Hustler, a Murder, and How I Lost a Year in Mississippi. It explores the murder of Richard Barrett, a white supremacist, by Vince McGee, his black neighbor. Safran heads to Mississippi expecting a case tinged with the embedded racism of the South. What he finds instead is a complicated crime with no clear motive--race or otherwise. The account of the author's yearlong investigation can be hard to follow: short sections with strange titles track Safran's moves through time, from one interview to the next, which presents the story in the order Safran uncovered it rather than the order in which the events happened. His journalistic approach can be brusque and perhaps misguided at times, as when he can't pay the convicted murderer for an interview outright, but gets around that law by giving McGee prepaid charge cards from Walmart. But his candid, informal style is endearing, revealing that God'll Cut You Down is as much the story of how Safran learned to write about crime as it is the story of why Barrett was murdered. Despite Safran's best noodling and puzzling and nagging of the police, lawyers, witnesses, family and friends of both the convicted murderer and the victim, the story of that murder is never made entirely clear; the entertainment comes from reading about Safran's experiences as an outsider snooping around an insular community.